The Wimbledon 2020 Master Plan will look at The Championships’ and the Club’s requirements for the next 10 to 15 years and will consider future opportunities beyond that period. The masterplan will include a comprehensive review of the whole site incorporating public, competition and operational areas to optimise the use of the site and enhance and consolidate the future of the grounds. 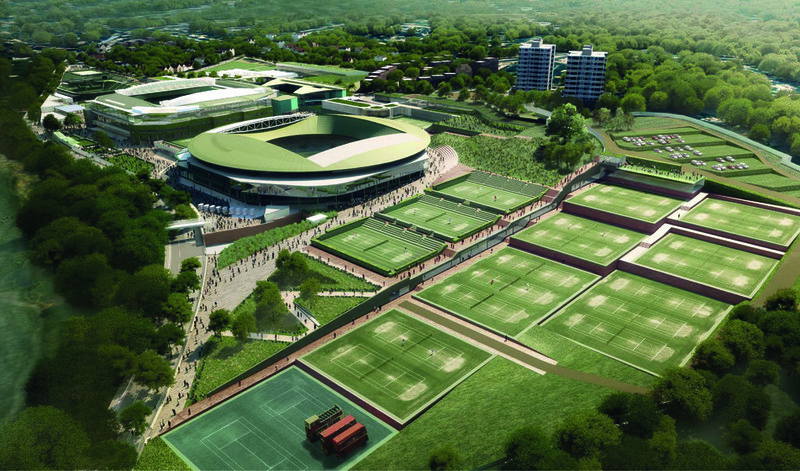 The key objectives established for the masterplan are to maintain Wimbledon as the pre-eminent Grand Slam tennis event in the world and to strengthen and enhance the Club as a worldclass sporting venue of national and international significance. The All England Lawn Tennis Club has high environmental aspirations for the project in which Atelier Ten have been involved. These include developing sustainability guidelines for the future development of the site, provide a Sustainability Plan for implementation on new and existing buildings and site management, reduce the impact of existing and new buildings on energy and water resource consumption, reduce impact of materials used in construction on the environment, improve the health and wellbeing, biodiversity and ecology of the site and finally to enhance opportunities to reduce upstream and downstream environmental impacts.